Saturn has a lot of moons. Two of them are really odd, and bear a striking resemblance to the Death Star from the Star Wars movies. Mimas has a crater of approximately the same scale as the one on the Death Star. Iapetus also has large craters, but the resemblance lies in its equatorial ridge. Mimas, the 20th largest moon in the solar system, has a huge crater Herschel named after the discoverer of the moon. The crater’s diameter is 130 km, which is almost a third of the moon’s own diameter. Herschel’s walls are over 5 km high and its central peak rises to up to 6 km. Some parts of the crater go as deep as 10 km. To show the crater’s scale, if there was one with the same scale on Earth, it would have been over 4,000 km in diameter, which would make it wider than Canada. 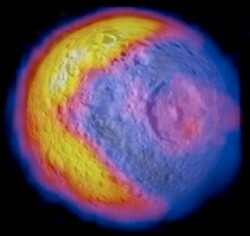 The impact that created this crater must have nearly shattered Mimas. The shock must have been so strong that fractures have formed on the opposite side of the moon. 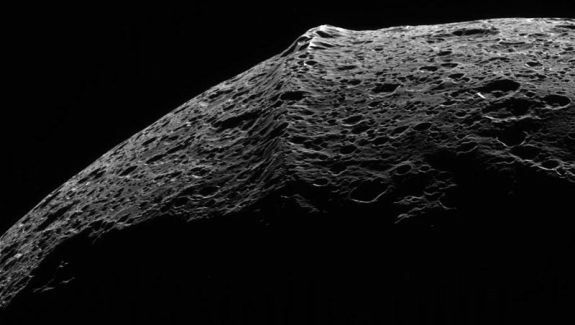 One such theory postulated by scientists associated with the Cassini mission, says that the ridge could be the remnant of an earlier time, when Iapetus was rotating much faster than today. The height of the ridge would suggest an initial rotational period of 17 hours. Iapetus cooled fast enough to preserve the ridge but remained plastic long enough for Saturn’s tidal forces to have slowed its rotation down to 79 days (as it is currently), heated by the radioactive decay of aluminium-26, which is theorized to have been abundant during the early stages of the formation of Saturn and its moons. The ridge could have been icy material that welled up from beneath the surface and solidified. If this ridge formed away from the equator, it would have destabilized the moon’s rotational axis. Therefore the axis would keep oscillating until it stabilized with the ridge following nearly perfectly the equator. Images of both Saturn’s moons are from the Cassini-Huygens mission (a joint mission of NASA, ESA and ASI – the Italian Space Agency), while the image of the Death Star is from the Star Wars movies. 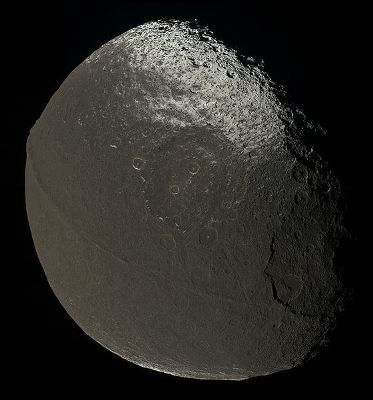 Iapetus has the equatorial ridge AND a large crater like the Death Star. You can see this in many pictures. Interesting that another moon also has the same sort of crater…..Hoagland’s info on Iapetus is quite fascinating, and required reading for those interested in more details on this mysterious moon. You should instead read the information returned by the probes NASA sent to the outer Solar System. The imagery we are able to obtain thru hi resolution optics never ceases to amaze me. I always wonder if we have equipment that is much more powerfulin use that the public knows nothing about. Wow, that imperial Death Star is cool! Why haven’t we built one of those instead of that stupid, cramped space station!